In celebration of my four year "blogiversary" I have a nice stack of knitting books to give away! 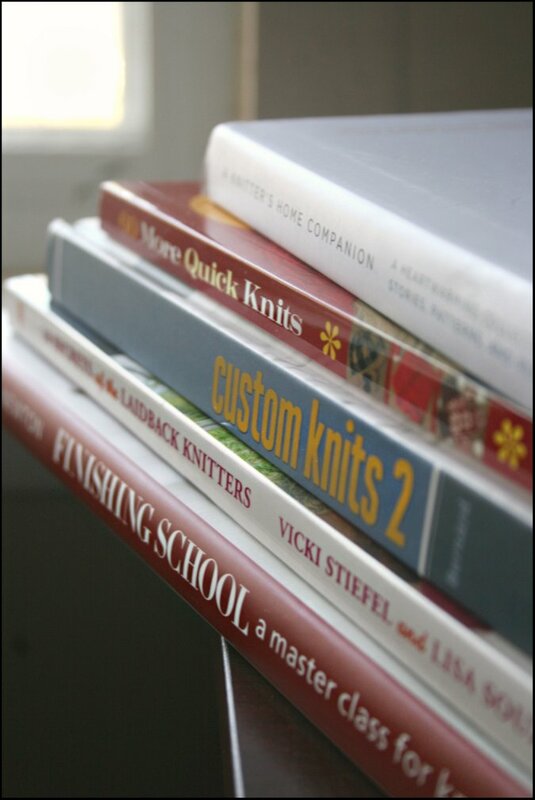 I love knitting books. Love. Them. There are so many fabulous books out there, but here are a few newer releases that will really round out your knitting library. What a completely charming little book this is. This isn't just a book of knitting patterns, a book of essays, or a recipe book.. it is actually all three. And it is put together in a very touching way. This book is written and illustrated by Michelle Edwards and in it she shares the role that knitting has played in her relationships with family, friends and her community throughout her life. 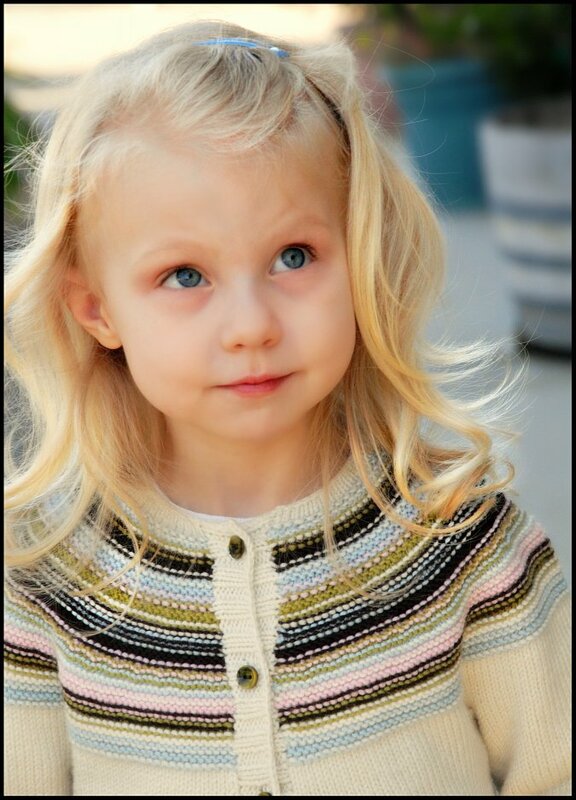 A great, go-to accessory book of 60 patterns all using Cascade 220 Sport yarn. 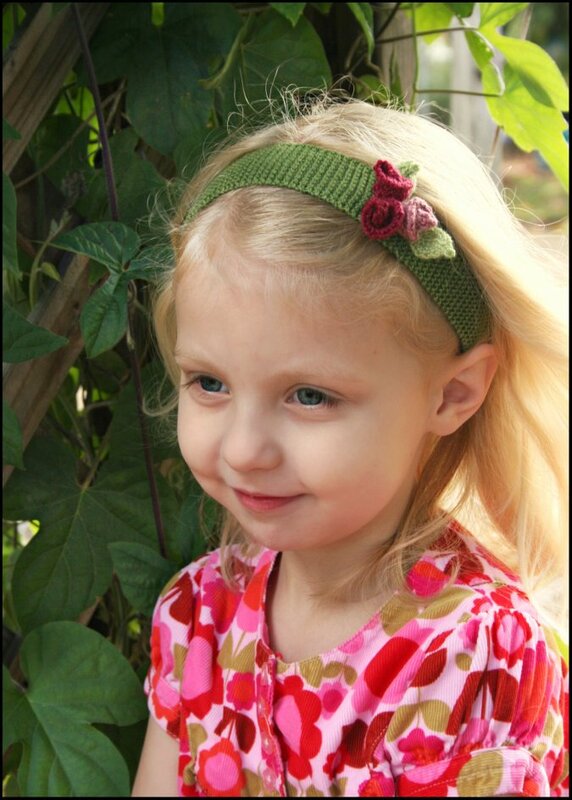 There are 20 hats, 20 scarves, and 20 mitten designs for you to choose from. 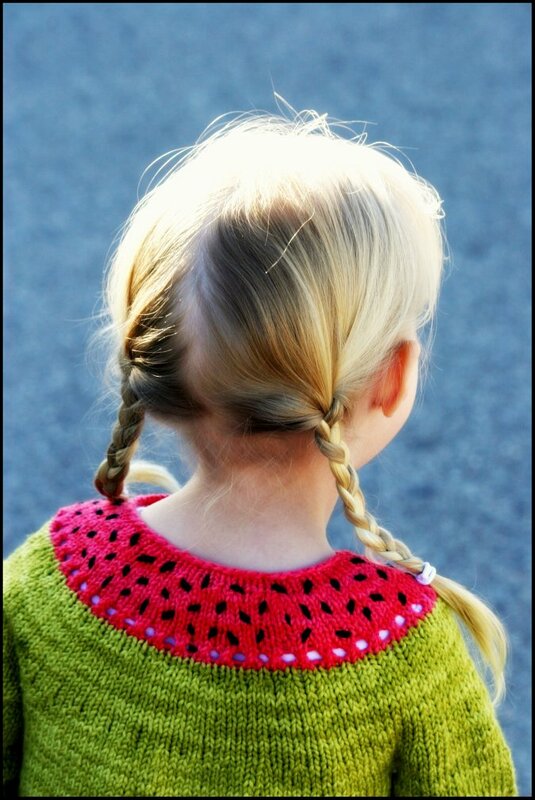 This book offers many cute patterns in a wide variety of styles so there is something here for everyone. 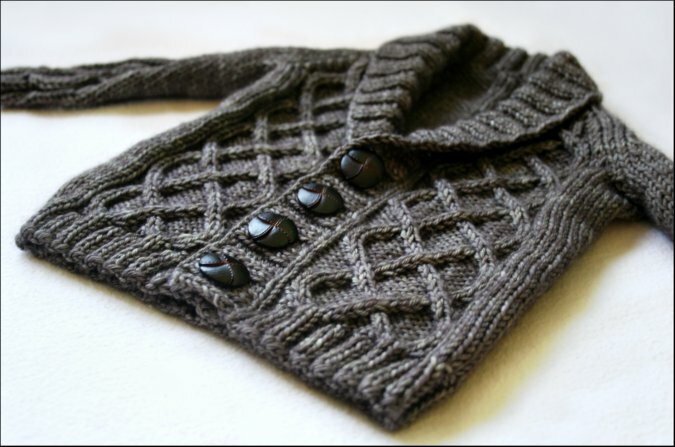 This is a great resource for knitted gift ideas. Ok... I seriously am in love with this book! 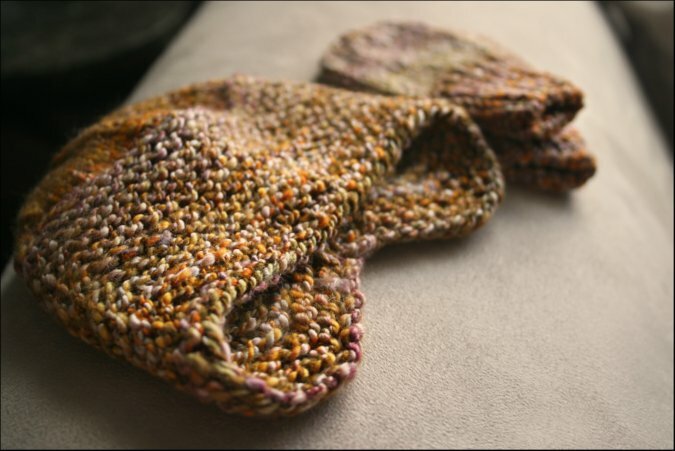 My time as a knitter has taught me how important finishing is for every knitted project. This book covers it all. Zippers.. seaming.. steeking.. blocking.. everything. It's a great reference book. I think that everyone should own a copy! I will randomly pick and announce a winner from among the comments left on Sunday December 4th. You have until December 3rd to enter. Remember only one comment per person please. And if you do not leave any contact information for me such as an email address, ravelry id, or so forth, I will have to pick another winner if your name is chosen. I have had too many problems with unclaimed prizes and it's important that I am able to get ahold of you if you win. Thank you! And just to make sure.. you do know about the blogiversary pattern sale, right? Four years ago, on November 26th, I started the Never Not Knitting blog... and I am so glad that I did! 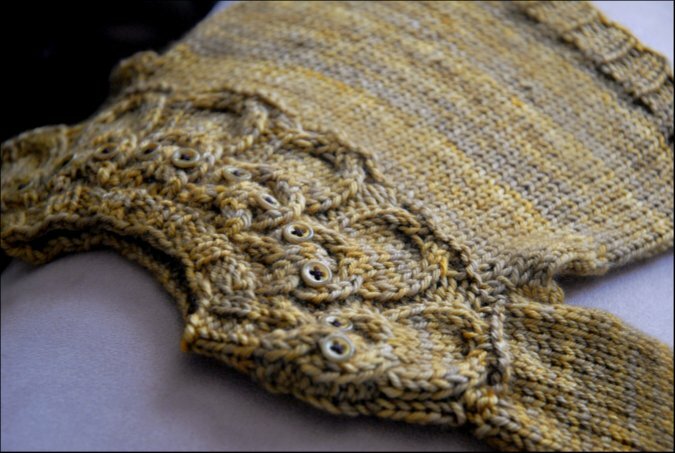 This knitting blog has opened up amazing opportunities for me, allowed me to meet so many inspiring and talented people, and has completely changed the course of my career. My blogiversary date of November 26th is certainly a day to celebrate, and every year I try to do something special on this day for my readers. As a thank you to all of you who have supported me over the past four years, I will be offering up a special sale and giveaway starting tomorrow. 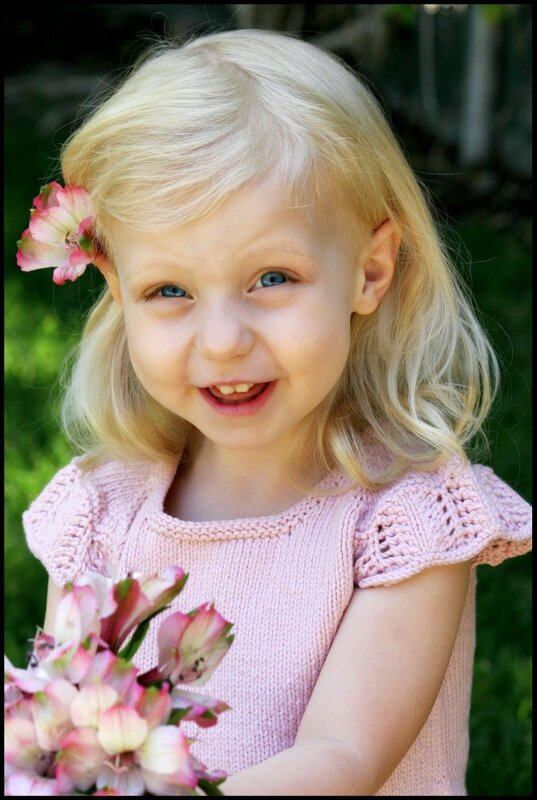 In honor of our new little baby, all of the Never Not Knitting children's pattern pdfs will be 50% off. The sale will go on all day tomorrow, November 27th, from midnight to midnight PST. To receive your discount, please enter the special code "4yearsofnnk" in the checkout process. Here is what you have to choose from! And just so there are no misunderstandings... To make a purchase, please visit my pattern store HERE, Please click the 'add to cart' button below the patterns of your choice. A new window will pop up called 'Ravelry Shopping Basket'. You will see a little link at the bottom that says "Use Coupon Code", please enter in the code there. Then click 'apply'. Please email me if you have any questions: nevernotknitting@gmail.com. 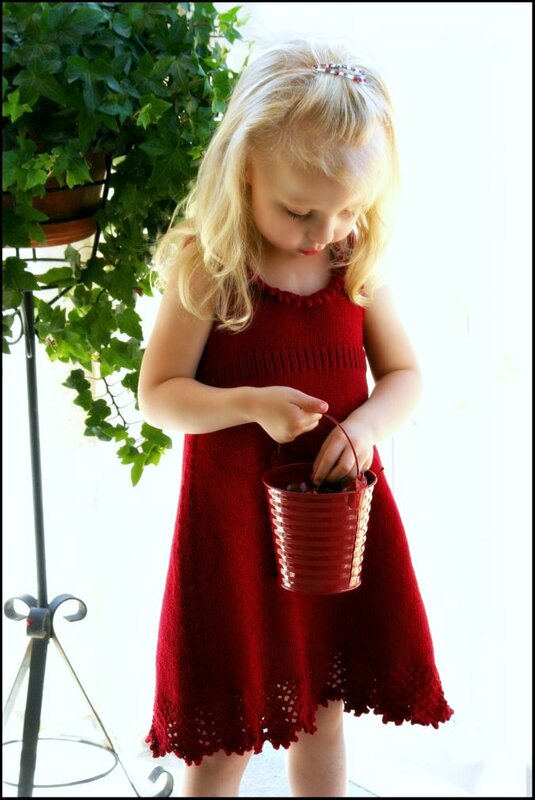 Enjoy your new patterns and please check back tomorrow for an amazing drawing giveaway for you to enter! 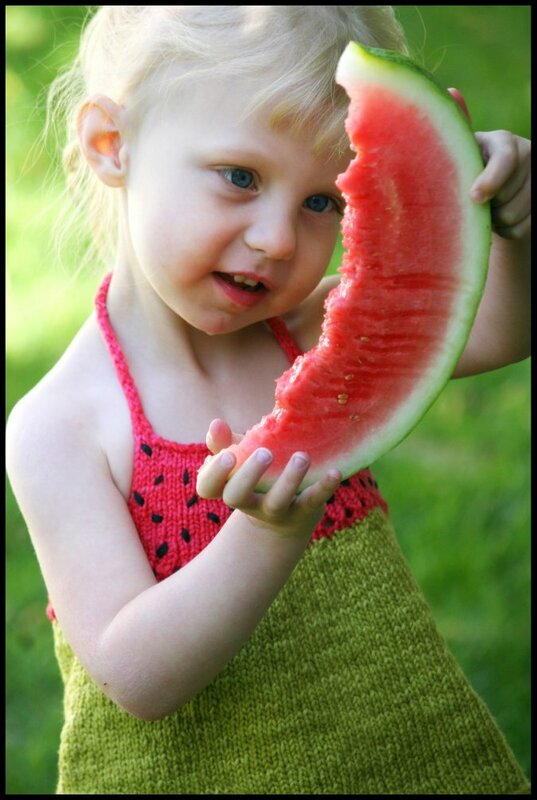 I feel similarly about chocolate-covered strawberries as I do about handknit-covered babies.. Both are great by themselves.. but together, they make for an amazing combination. 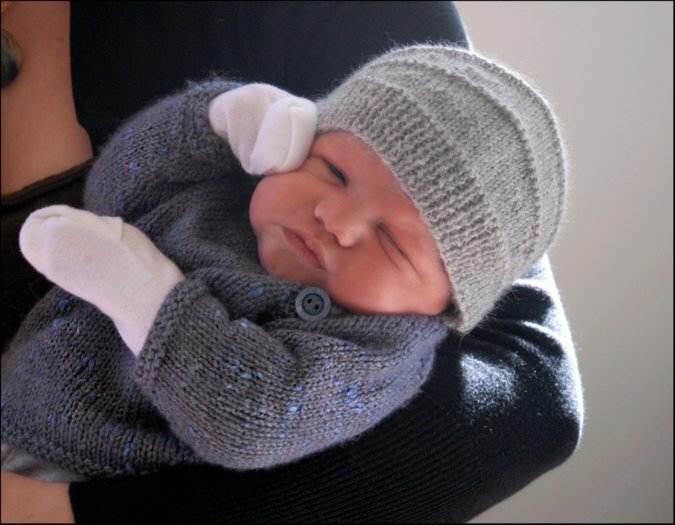 I take advantage of every opportunity for our little guy to wear his handknits.. as many as possible at one time. 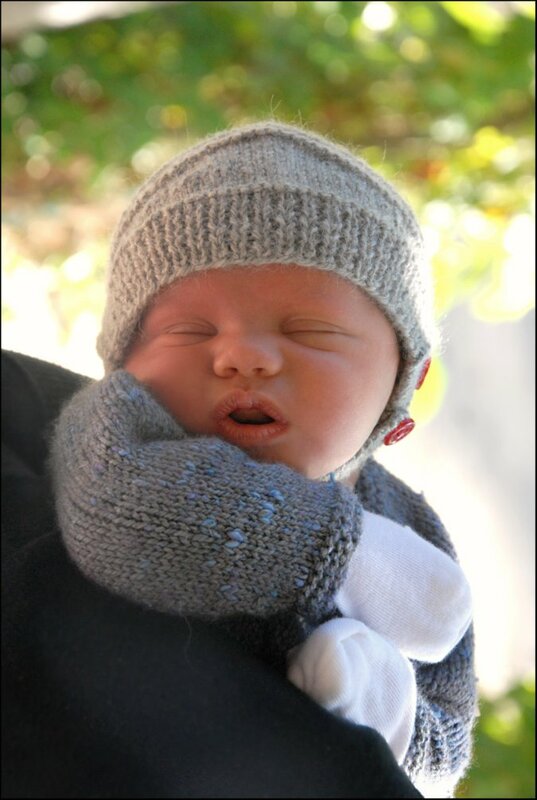 For his one week doctors appointment, I dressed him in a little handknit bundle with his Puerperium cardigan, Aviatrix hat, and Saartje's Bootees... Which turned out to be fairly ridiculous because as soon as we walked in to see the doctor, the nurse instructed us to strip him down to his diaper so that we could weigh him...oh well. It was fun while it lasted. I love seeing him in his little sweaters so much that I've been putting them on even on days when we don't leave the house. I have a tendency to suffer from that weird syndrome where you don't use things because they are "too special". I don't want to do that with these handknits. Seeing him wear them makes me really happy and if I keep waiting for special occasions, he may never get to wear them at all. Babies grow so fast and all. Acadia is an absolutely beautiful, completely original and custom designed 2-ply yarn with a rustic look and soft hand. A subtle tweed effect created by the silk noil is combined with a heathered base and then overdyed in the duotones we are known for, creating incredible depth of color. 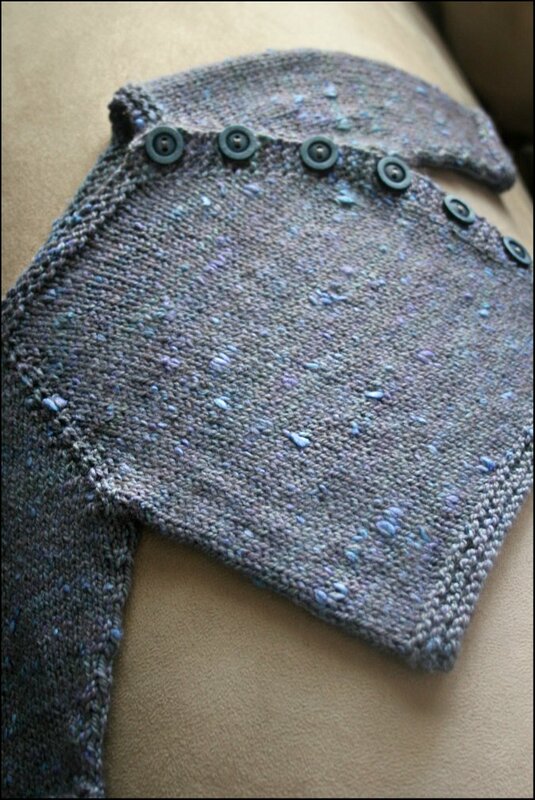 A couple of weeks before my due date, you may have remembered me mentioning that I had a few unfinished projects on the needles..
Once I finished my Gramps Cardigan, I realized that there was no way I was going to finish up my Rocky Coast before the baby came. Instead I opted for an instant gratification baby knit. I decided to make our little one a last minute Owlet sweater out of the beautiful Madelinetosh Tosh DK in the Olivia colorway. This tiny sweater only took me a couple of days to knit up.. which was perfect timing! 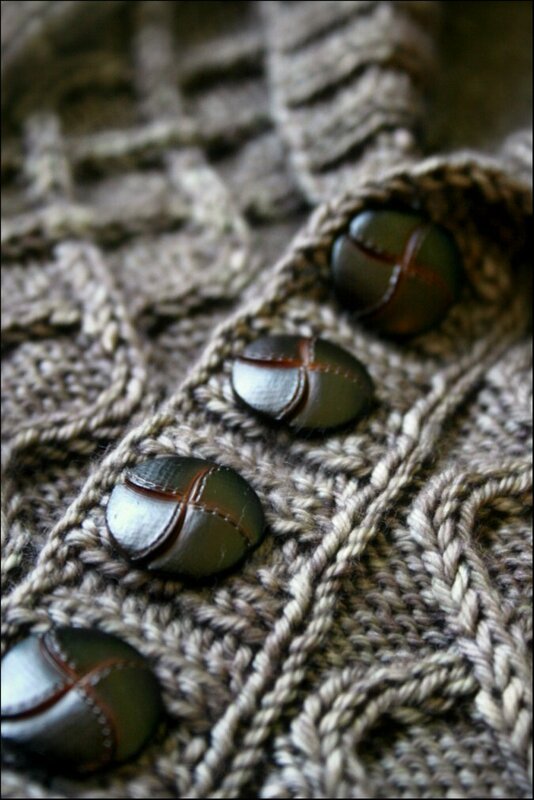 Do you see the little owls perched on the yoke? 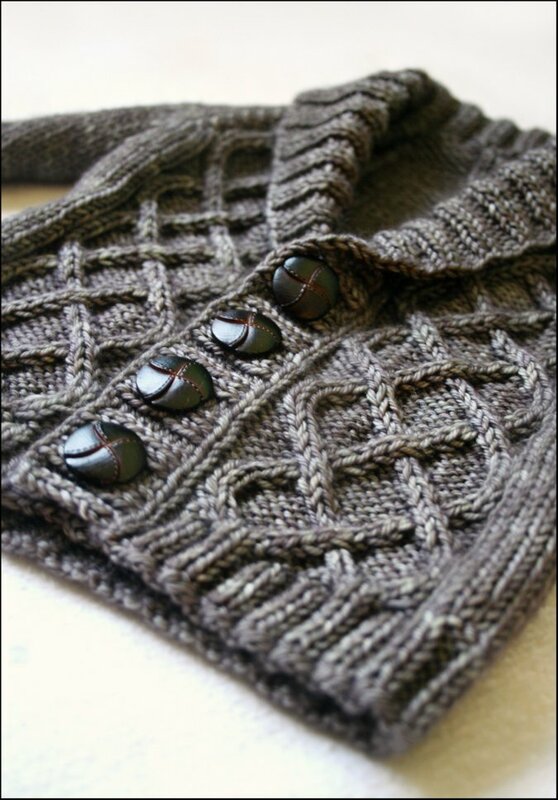 I've always found Kate Davies' Owl sweater patterns so incredibly clever. I've been meaning to knit myself one for quite awhile. 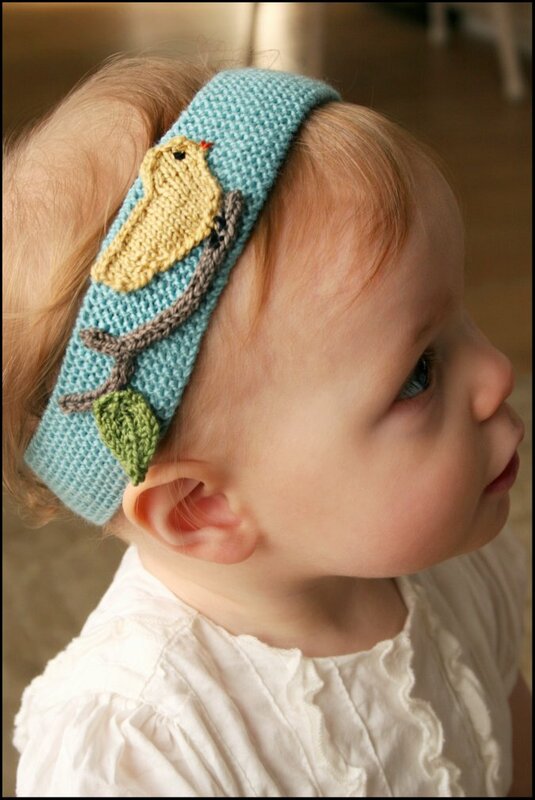 Eventually it would be great to make one for my daughter as well so that her and her brother can match. Three days before my due date I went into my local craft store in search for the perfect buttons for the owl's eyes. The lady working that day insisted that this sweater would NEVER fit our baby. She felt that it was entirely too small and that it was better fit for a doll. She mentioned this maybe.. um... 10 times. As I left.. she said... "You wait and see.. that sweater will never fit that baby..."
Well guess what lady... I tried it on the baby.. and it's too big. 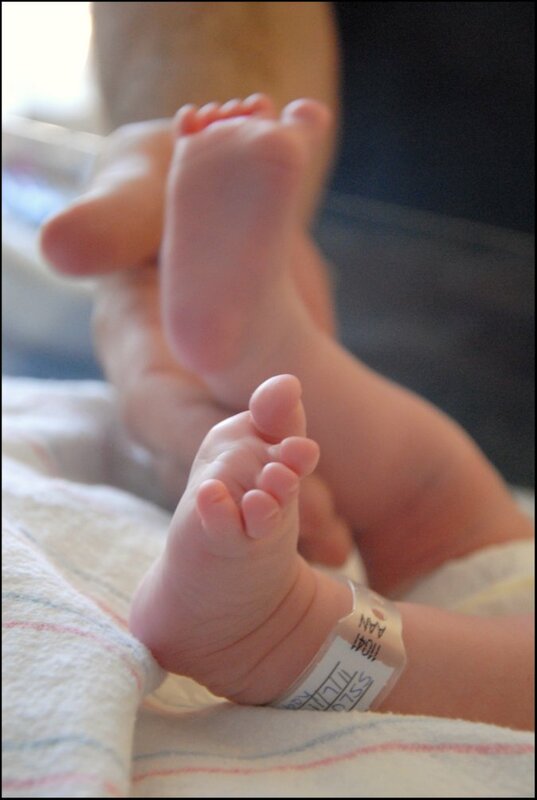 I am so happy to tell you that on Monday, November 7th, we welcomed our new baby boy. He is soft, and sweet and just perfect in every way. I couldn't have asked for a more precious baby. Seriously.. I love this little guy.. I can't even begin to tell you how much. I still can't believe that he is actually ours. 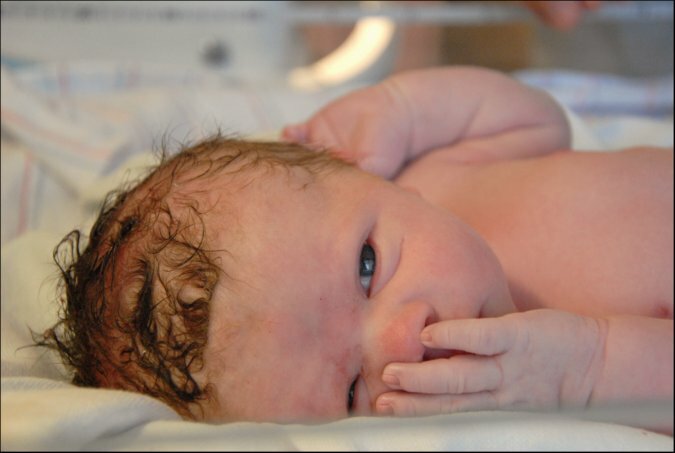 While I was pregnant, I guess I just assumed that our second child would be exactly like our first. 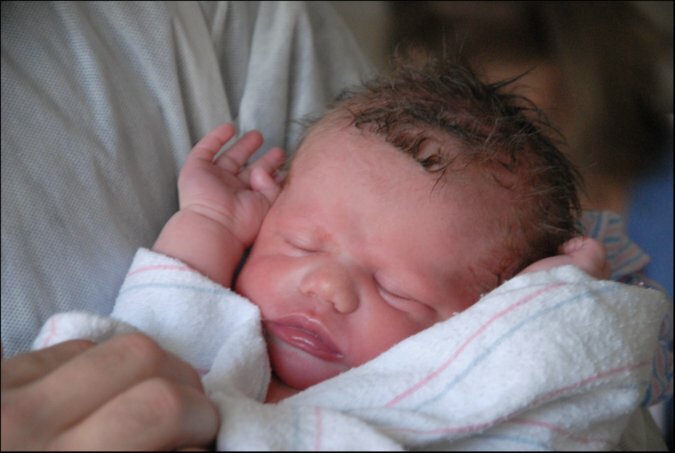 I was expecting a light haired but mostly bald, 10 pound baby... but we ended up with this little guy instead.. a full head of dark hair and almost a full pound less than our daughter was at birth. But still more beautiful than I could have envisioned. 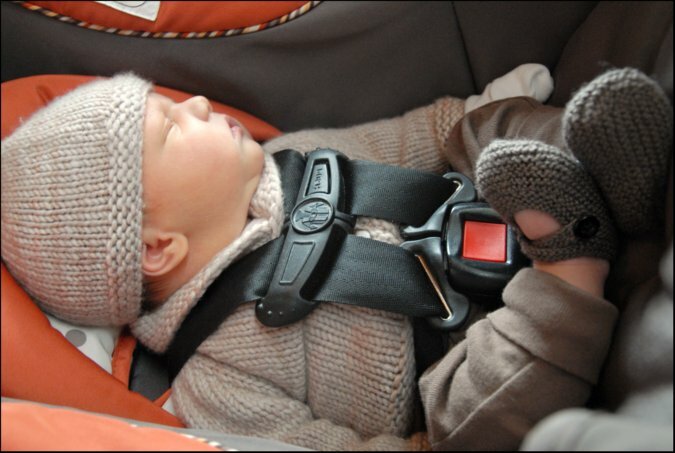 Soon after birth, I felt that it was only fitting for our new one to be adorned in handknits. 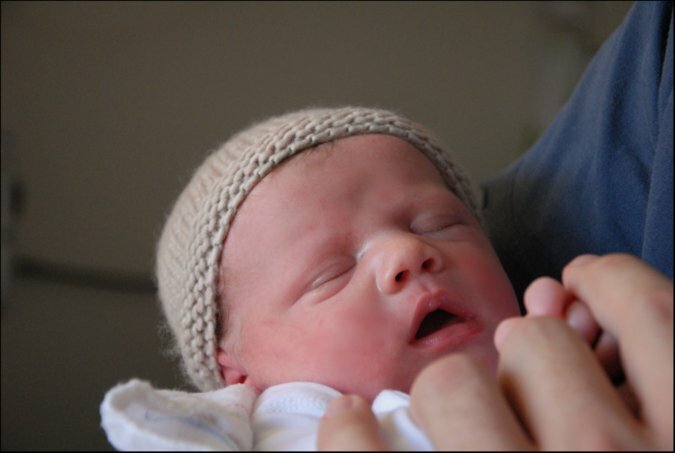 Very quickly he was dressed up in his Malabrigo baby hat and matching Baby Sophisticate cardigan. So that he could look his best when we introduced him to his big sister and the rest of our family... of course. And then again we just had to dress him up to go home. This time in the full ensemble with the coordinating booties... which fit by the way! 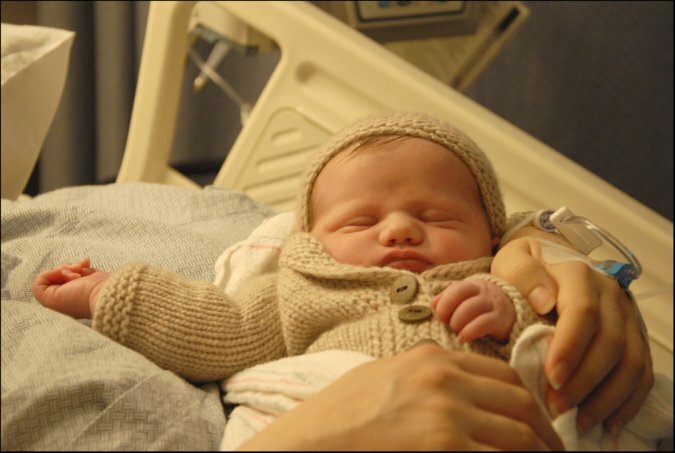 As we walked (or in my case.. were wheeled down) the halls of the hospital on our way out, I couldn't help but feel so much pride as both a mother and a knitter to overhear multiple nurses and patients commenting on the sweet little baby "in the sweater". 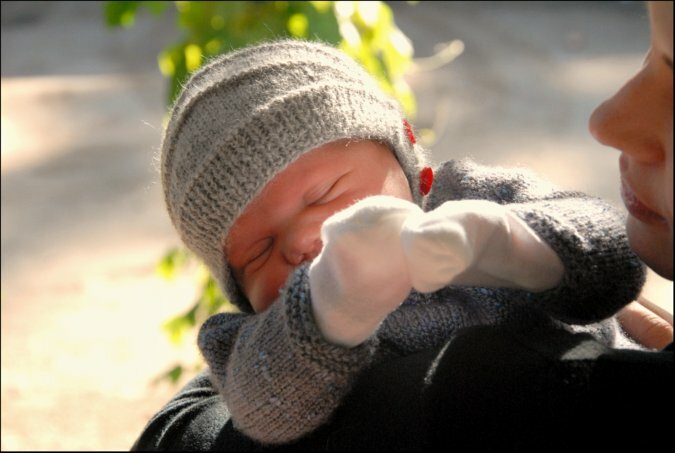 Here is this new little life that I have created and nurtured for the past several months, and the handknits that were carefully selected and knit just for him. There is no greater sense of accomplishment than to see the two together. Several weeks back I knit up this quick little set for our new baby out of a gorgeous skein of Becoming Art Handspun yarn that has been waiting patiently in the stash for some time now. The hat was knit from the pattern Quynn from the book Bambeanies. I love this design! Not only is it fun and quick, but I love how the ear flaps are constructed! Although I love the look of them, I've never been fond of knitting ear flaps onto hats.. until now. 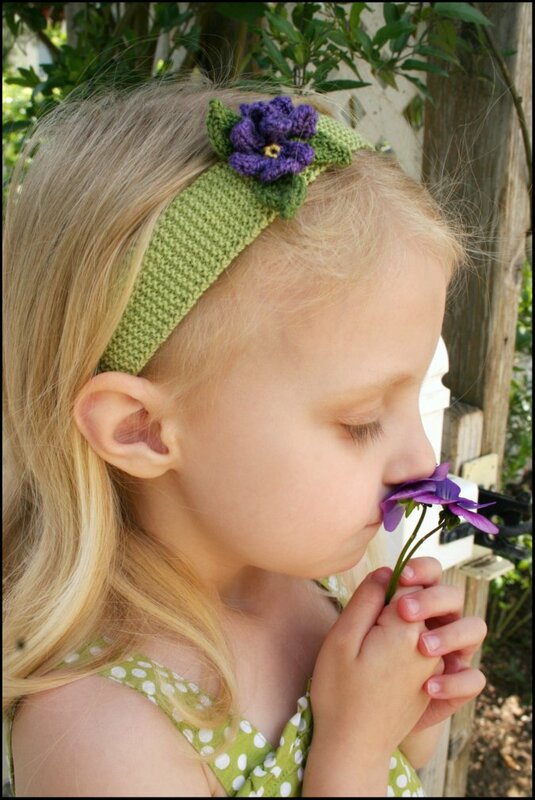 These ear flaps are created as you knit through increases and decreases.. no picking up stitches... so nice! 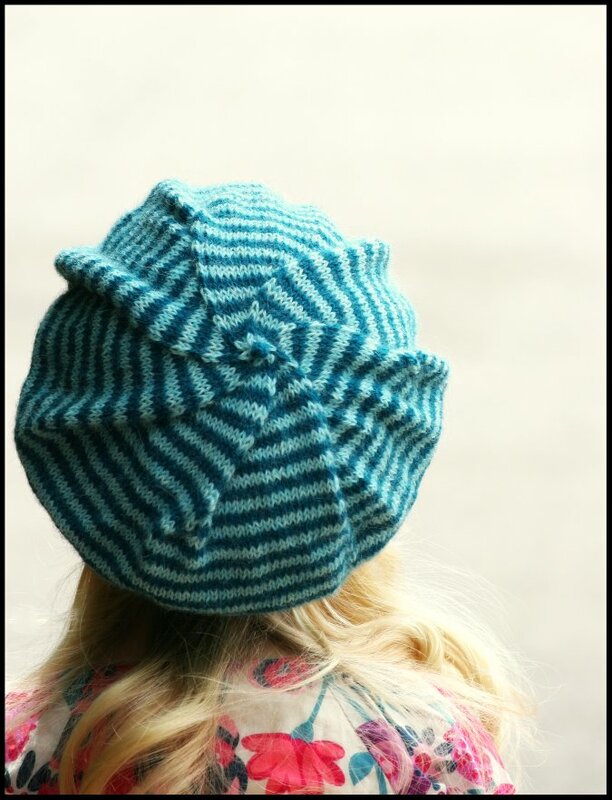 This is a seriously adorable hat that I will be making again! 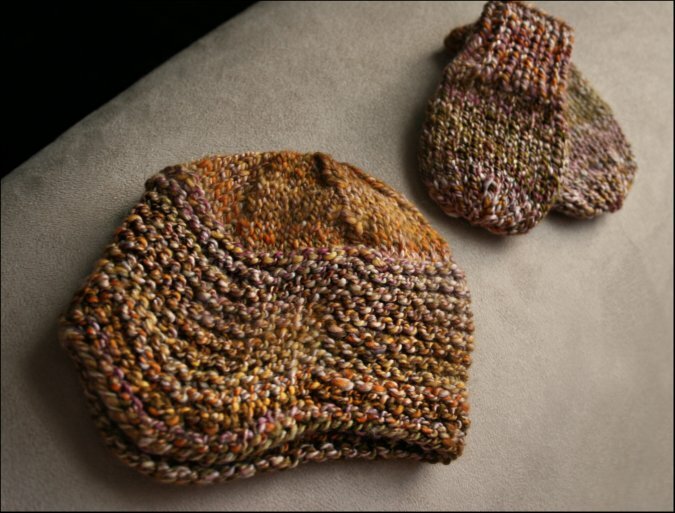 Along with the hat, I knit up some quick matching baby mitts out of another fabulous children's knitting book, 60 Quick Baby Knits. 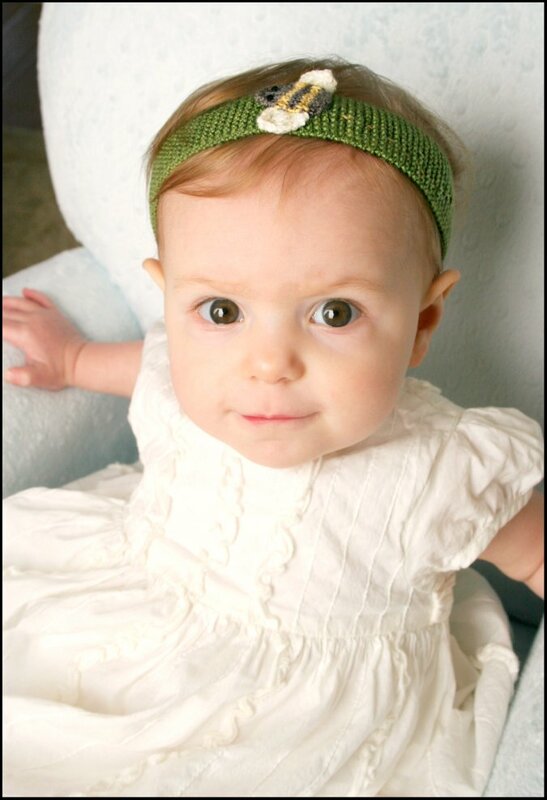 This book has tons of great practical baby patterns all knit from Cascade 220 yarn.. the perfect worsted weight. 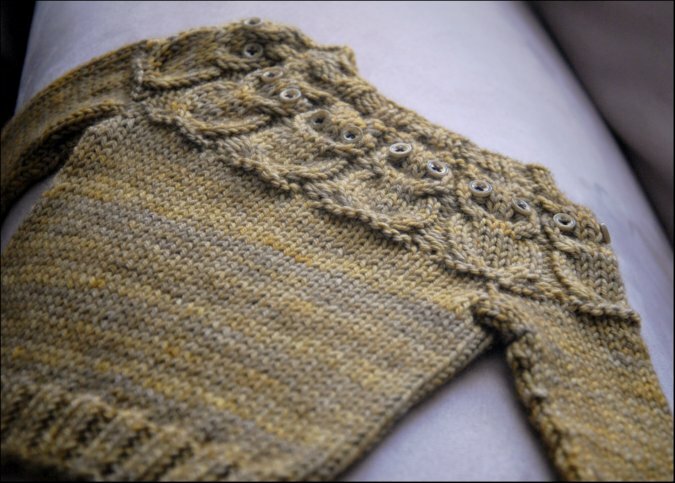 I can't wait to see our little guy in this handspun set! Another newborn sweater off the needles and ready for our baby boy. This is knit from the Puerperium Cardigan pattern, and as soon as I discovered it, I felt the need to knit it IMMEDIATELY. It is a newborn sweater that I think will be so easy to slip on and off. The side buttons are extra adorable too. The pattern calls for a small amount of DK weight yarn which I may or may not have massive quantities of. 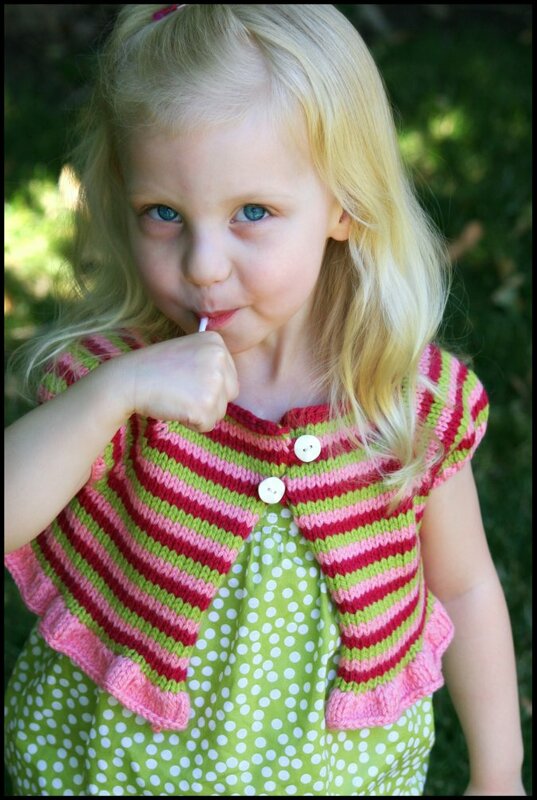 There is nothing like tiny baby knits for using up stash yarn! 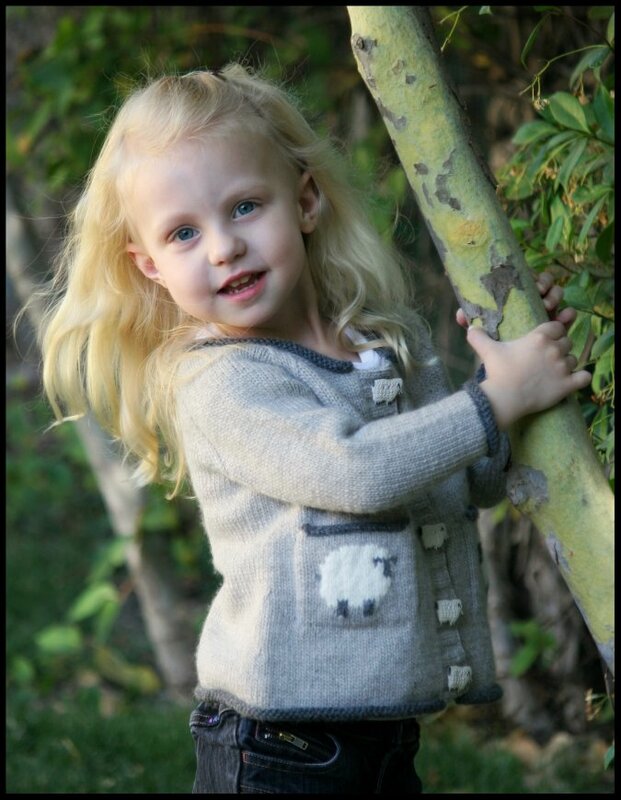 For this sweater I used a new Fiber Company yarn that I've been dying to try called Acadia. 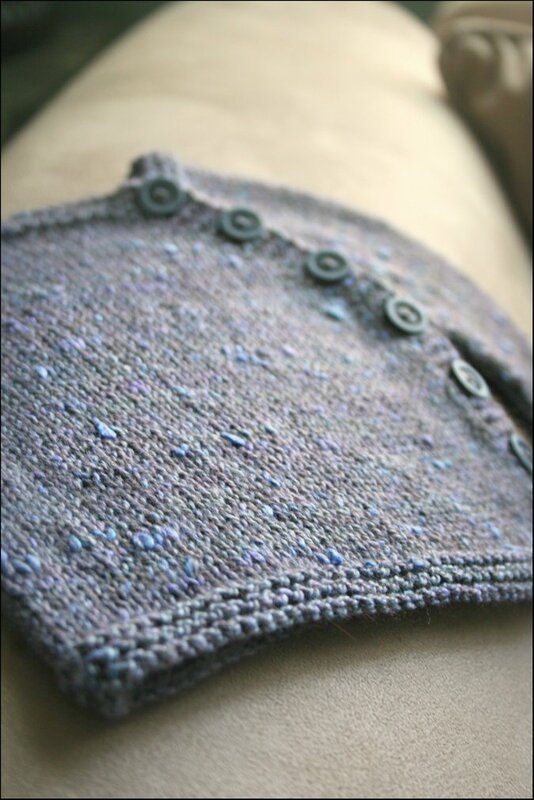 The wonderful softness and tweedy quality of the yarn made it really fun to work with. I rarely work with textured yarns such as these. It was a nice change of pace. I was glad to have found a good application for these 2 skeins that have been lingering around for months. Now to find projects for all of that "other yarn".